Many people said that the game itself was boring and uneventful. I only watched half of it, but I do distinctly remember that at least an hour of it was spent without a single score. It remained zero-to-zero until the Boston Patriots got a three. I predicted they would win (I wasn't truly rooting for anyone, in particular, this year), and I was right. I woke up the next morning, and it was a victory of 13-to-3. So while they did beat the LA Rams, it probably wasn't a very exciting game. Only one touchdown was scored the entire time. Sure enough, it happened to be the lowest scoring Super Bowl in history. So no wonder that everyone (even my science teacher) was talking about how boring it was the next day. The Patriots won for the billionth time? Woohoo. Thanos---I mean, Tom Brady, did it, I guess. But even for what I was actually watching for, it was somewhat underwhelming. Like any non-football fan, I was mostly there for the commercials. Why? Well, the Super Bowl is a very special annual event. Millions of people from all over America tune into it every single year. That is why advertising spots are at an all-time high in terms of cost. A single ten-second advert can cost millions of dollars to purchase! That is why the companies that shell out this money to advertise usually make them extra-special and interesting. They are typically more original and fun to watch, since they want to be able to get more publicity and public attention. Xiang was talking about this one commercial I didn't see, for some sort of laundry detergent, in which some elderly guy was dancing in the shower. My favorite commercial in the Super Bowl would be last year, which is an M&M commercial where my idol, Danny Devito himself, turns into a human M&M. He also gets run over by a bus and asks people on the street, "Do you wanna eat me?" If you haven't watched it yet, you're missing out, so I suggest that you watch it below. This time, though? Most of the commercials weren't super memorable. Some of the few that I were awake to enjoy were the movie trailers for Avengers: Endgame and Captain Marvel. Oh, and the Pringles ad where Alexa complains about being a cold, cruel metal device without a soul, until she gets interruped by a request to play "Funky Town". Apparently, all of the good stuff appeared after the Halftime Show. When I was asleep. Some examples of stuff that I missed out on were an Amazon commercial with Harrison Ford, a Toy Story 4 trailer, and a tear-inducing ad for Xbox's Adaptive Controller (made for people with disabilities). Fans had mixed reactions to this. While overall the reaction was negative, some felt grateful that we got any clip of Spongebob to begin with. Even if it was just a few seconds, it was still a tribute to Stephen Hillenburg. However, others pointed out that it wasn't "Sweet Victory" like what was promised, and that it just seemed like the fans had gotten baited into watching it. I am somewhat a mix of these two views. While I love the fact that there was a Hillenburg tribute in any way, shape, or form, I still think that it wouldn't have been too difficult to make it longer. What, was it too much to choreograph an entire extra song for Maroon 5? They could have just literally played the two-minute song clip from the episode, and we would have been somewhat happier. It's either that they are biased, or they are correct. I'm leaning toward the latter. Now that, my friends, would have been amazing. But instead we got Adam Levine and Travis Scott rapping "Sicko Mode". Sigh... One day, my friends. One day. I'm actually quite looking forward to the inevitable Mandela Effect that this will cause, years down the line. 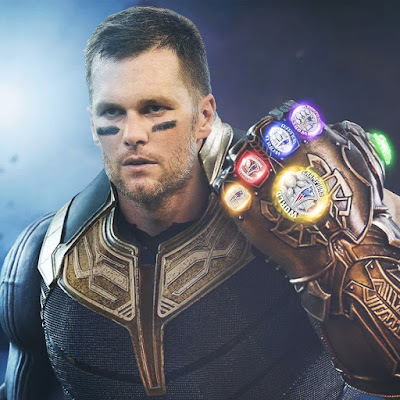 This is exactly how this year's Super Bowl was meant to be remembered, but unfortunately, this post already serves as a debunker for any sort of wishful thinking. If it makes you feel any better, just watch the Otamatone cover of "Sweet Victory", created by the highly talented YouTuber TheRealSullyG. I think his content is somewhat underatted. He puts lots of effort into them, and the songs he chooses are either old songs or meme songs. He even dresses up the gosh darn instruments... I never knew an instrument could be so adorable! BREAKING NEWS: A new competition that's better than the Super Bowl! Speaking of super-competitive sports competitions that appeal to young people... There's a new Splatfest for this weekend only in Splatoon 2! Pancakes v.s. waffles, huh? I'm more of a waffles person. Waffles are like the Swiss Army Knife of breakfast food... They not only hold toppings well, but they taste delicious! 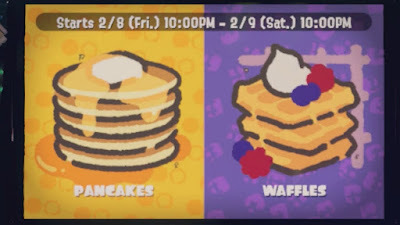 Sorry, mushy pancakes, but #TeamWaffle all the way! This is Arca, signing off for now. I haven't posted in a long time, I know, but that's because I was super busy. But that business is now over. Expect a full explanation of what to expect next from my blog (and oh boy, you guys are in for a treat that's better than waffles) in one of my next posts, coming as soon as possible. Trust me, my blog is far from dead. It's in a state of revival. hi its raum, here to say hi. this was linked as an example for 8th grade blog project we're doing lol and I was just like.. "ARCA YOU'RE STILL DOING THIS!?!?!?!?" Yes, it's been five years, I know. But, contrary to popular belief, I'm still at it. I post every week, so thanks for checking it out. Also, just curious, you said its an 8th grade project, what teacher is it for? Really curious as to which of my current teachers showed their class my blog, haha.